Seoul, Korea; February 1, 2018: GE Power (NYSE: GE) has been awarded a $320 million contract through its joint venture, KAPES, by Korea Electric Power Corporation (KEPCO) to provide equipment and expertise to deliver a 4 GW HVDC transmission link from the power complex located East of South Korea, to Seoul’s metropolitan area that represents around 40% of global Korean energy demand1. With 51.3 million people2, South Korea has experienced nearly a 35% growth3 in energy demand in the last decade alone. The country faces the ambitious challenge of providing efficient energy to its densely populated areas. 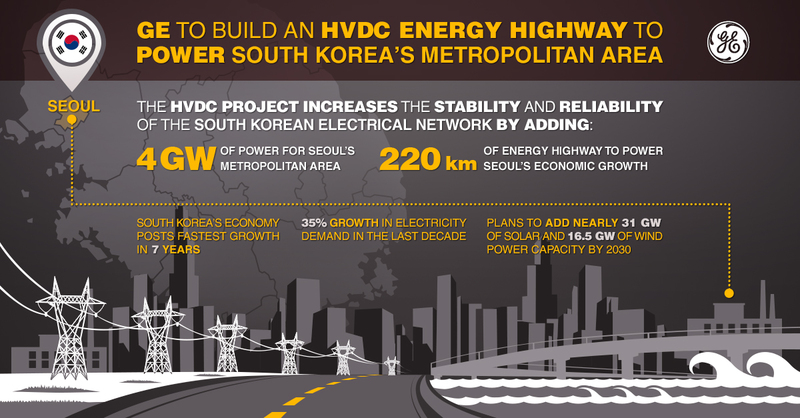 This new HVDC project will increase the stability and reliability of the Korean electrical transmission grid by adding new routes for power supply. GE together with KAPES will design and supply the overall HVDC system, a 500 kV HVDC Bipole with two converter stations, including valves, cooling system, converter transformers, filters, switchyard, and control system. The technology is the optimal answer to resolve Korea’s environmental constraints. This HVDC system has a reduced environmental impact compared with traditional alternating current (AC) system. 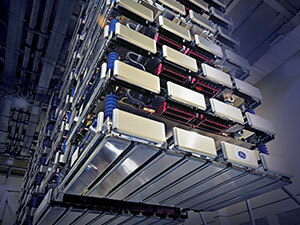 GE Power has in the past successfully delivered three important HVDC reference projects in Korea. GE provided the original 300 MW HVDC Bipole link for the point-to-point submarine interconnection linking South Korea’s Jeju Island across 101 kilometers with the mainland in the late 1990s. In 2009, GE was awarded and delivered a second project to supply the new converter stations for the 400 MW HVDC Bipole scheme. In 2014, through its KAPES joint venture, GE was awarded the 1.5 GW Buk-Dangjin–Godeok HVDC connection to transmit energy from the Dangjin power plant west of South Korea, to the densely populated area of Pyeongtaek (Godeok) and Seoul Metropolitan, about 35km east of Dangjin. The project is currently in progress and will be completed end of 2019. The KAPES joint venture between GE and KEPCO is a long term strategic relationship to co-develop HVDC projects and increase Korean transmission grid capabilities based on GE technology. Since 1976, GE has contributed to the advancement of the Korean economy and industry by offering leading infrastructure technologies. Working closely with partners and customers, GE has been delivering long-term growth, leveraging Korea’s capabilities and our strengths to perform locally and globally. Currently, 1,400 employees are offering the leading infrastructure technologies and various services in the fields of Power, Oil & Gas, Aviation, Healthcare etc. in Korea.